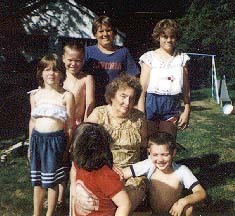 Grandkids and Great Grandkids were always an important part of Grandma Cook's life. The purpose of this page is to share images, many of which Grandma Cook kept among her treasured photographs. These pages are divided into three parts. Grandma and ...These are images of Grandma and grand or great grand kids. Some we have identified some we haven't. Grandchildren Here are photographs of the Grandkids- mostly when they were younger! Greatgrandchildren These are individual or group shots of Great Grand children. Feel free to send me more! If you don't see yourself or your kids, be patient. I have many to add! If you have an image you would like to have put on the site, please send it to me!